Layers of antique gears overlap and rotate freely in-between sheets of glass. RoundTimers are Davide’s highly engineered signature construct, which are employed with great variation as central components in many of her industrial inspired, kinetic sculptures. Davide banks on our inclination to associate any round form in the accompaniment of gears with actual timekeeping clocks in order to provoke viewers to wonder about the very nature of time itself. Tinted View is an outstanding example of a modern yet classic Gear Art sculpture by noted artist, Andrea Davide. Encompassing warm, sumptuous color painted directly onto freely moving gears, Tinted View converts even the most casual passerby from viewer into participant. 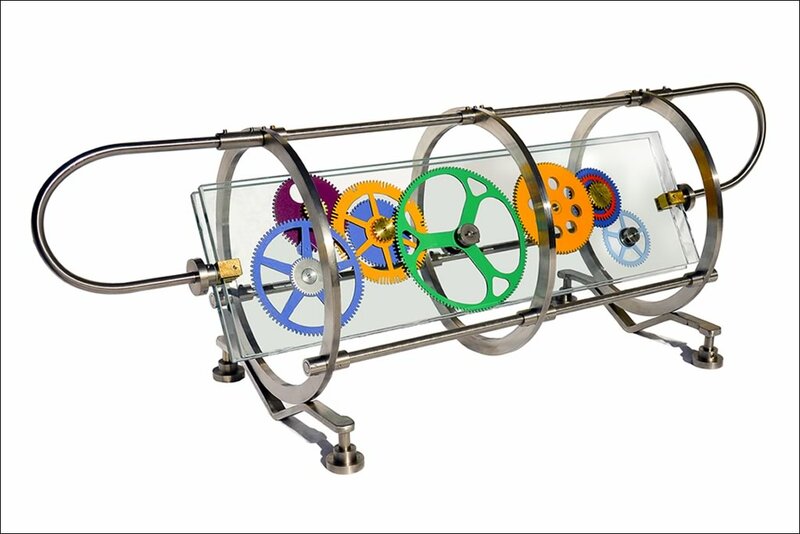 Gears are staked directly into movable glass panels, which are themselves secured inside a stainless steel framework. 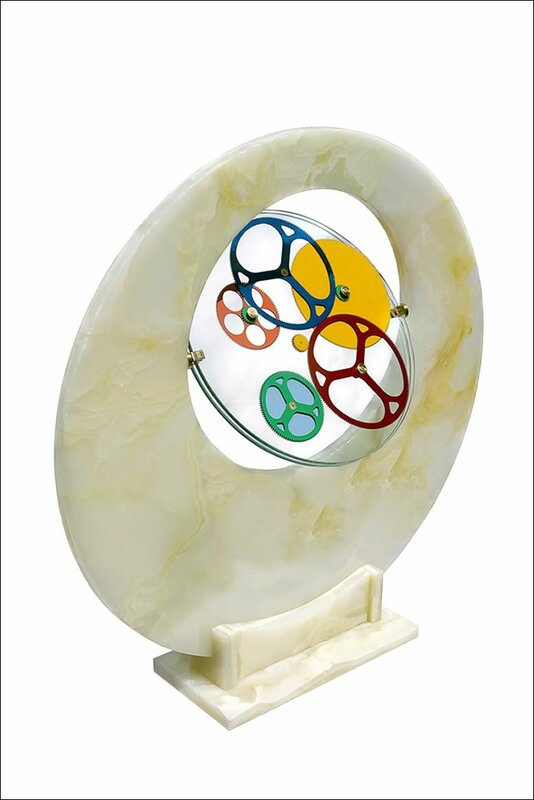 Using classical sculptural materials of marble and brass to encompass her signature RoundTimer motif, Future Recollection is a reflection upon artist, Andrea Davide’s personal uncertainty regarding the direction of time’s arrow. Glass discs provide a central transparency, suggesting a contrast between the solid reality of the moment in which we exist, and ephemeral questions regarding exactly what the difference is between hours past and hours yet to come. A companion to the sculpture, Nicholas’ Reach. Often trying to confound viewer’s visual presumptions, in Coupled, Davide uses materials in unexpected ways to elicit contrasting responses. Coupled is a commentary on the nature of lifelong relationships. Bent stainless steel shafts appear as singular and unbroken, whereas in actuality each is comprised of multiple pieces, joined together with beryllium copper couplings, resulting in the illusion of a single entity. A wall hanging sculpture examining the construct of time. 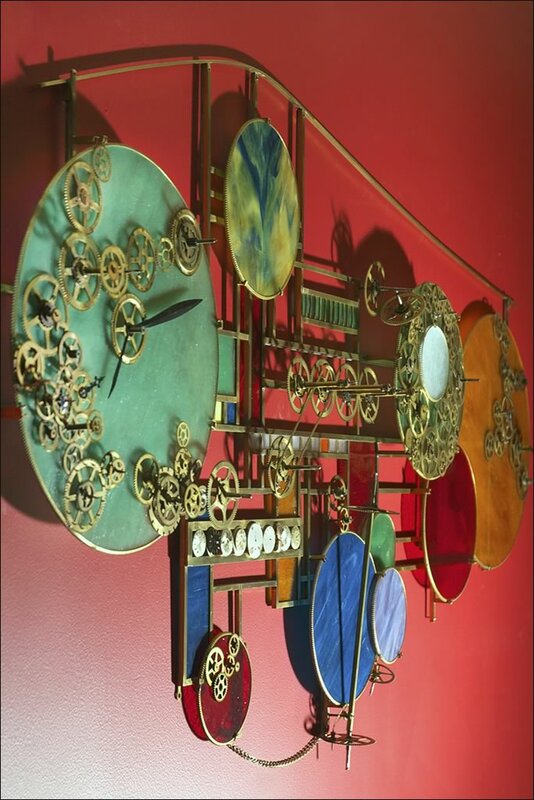 Davide’s large brass Gear Art sculpture is made from repurposed materials taken from time measuring devices, combined with other raw materials one generally associates with timekeeping, this wall art sculpture is a literal framework for Davide’s ponderances. At 7’ long, one can hardly overlook its Steampunk overtone or Industrial Age derivation. 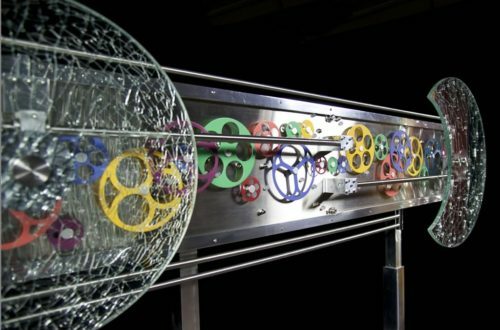 A kinetic, Steampunk inspired Gear Art sculpture rooted in the concept of “time” Created as a companion piece to Coupled, Nicholas’ Reach is the artist’s look into the nature of long-term relationships and a tribute to her late husband, Nicholas. Nicholas’ Reach is made of black granite, bent brass rods, antique gears, and glass. 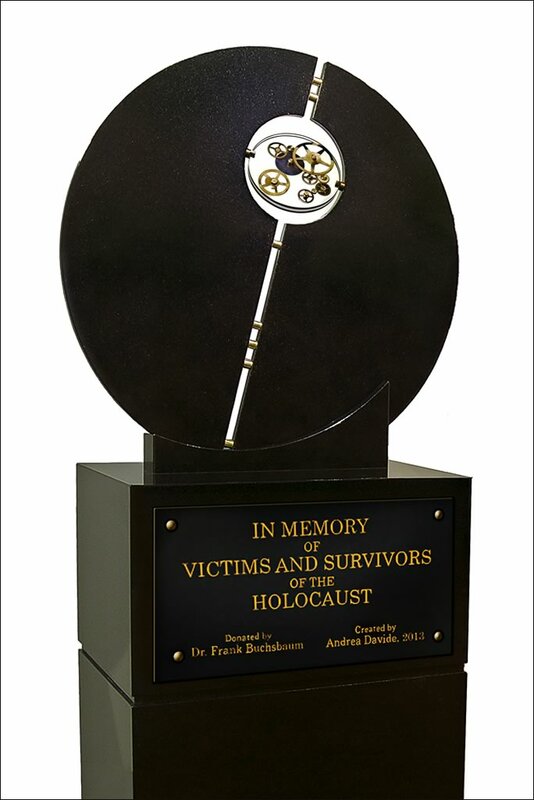 Forces Elemental, a large granite and glass sculpture, was purchased and donated as a public art sculpture by a Holocaust Survivor. It speaks to the tragedy of individual loss and the endurance; and triumph of humanity. Cracked glass discs, representing shattered existences, travel from their origination points towards the center of the sculpture, where they mate up and become one (as scattered people do in times of great external pressure); the glass discs then separate, returning to their respective origination points. All the time, in the background, the colored gears, representing life in the rest of society, keep turning with colored lights flashing from behind, unaffected by the shattered glass which wanders. 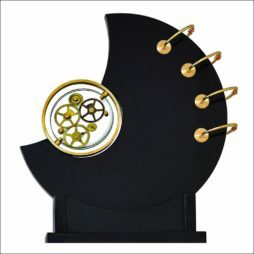 A wall sculpture, which is part of the artist’s original works in her exploration of time’s reality. 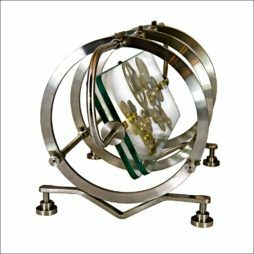 Its large, almost 6’ wide, open lattice structure incorporates stained glass discs and shapes, grandfather clock brass gears, and an entire collection of well used pocket-watches, all fit onto a solid brass geometric framework. 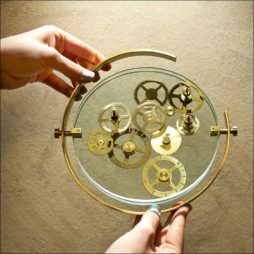 A small tabletop glass and metal sculpture with copper outer rings encasing the structure: The first in a series of kinetic works about time, its precision, and its transience. A gear extends beyond the frame, suggesting continuity and inviting the viewer to touch, to turn, to be involved. A new shape in Davide’s kinetic Timepiece collection. 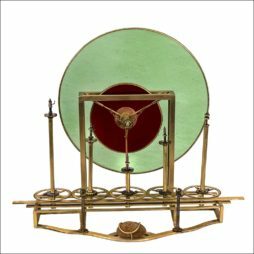 Made of brass, antique gears and sandwiched between two sheets of glass, these meticulously engineered sculptures, which are seated on brass easels, are easily picked up so as to invite interaction. They beckon viewers to hold, feel it’s perfect weight, and manipulate each one’s multidirectional actions. 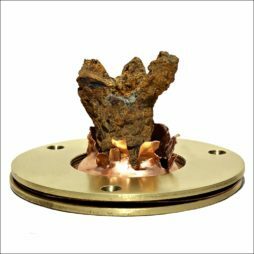 This work is at once part of an industrial age long gone, while remaining very much part of our present technological world; fresh and sleek and futuristic. 7.25”H x 19”W x 6.5”dia. An industrial inspired, highly engineered, kinetic metal sculpture. 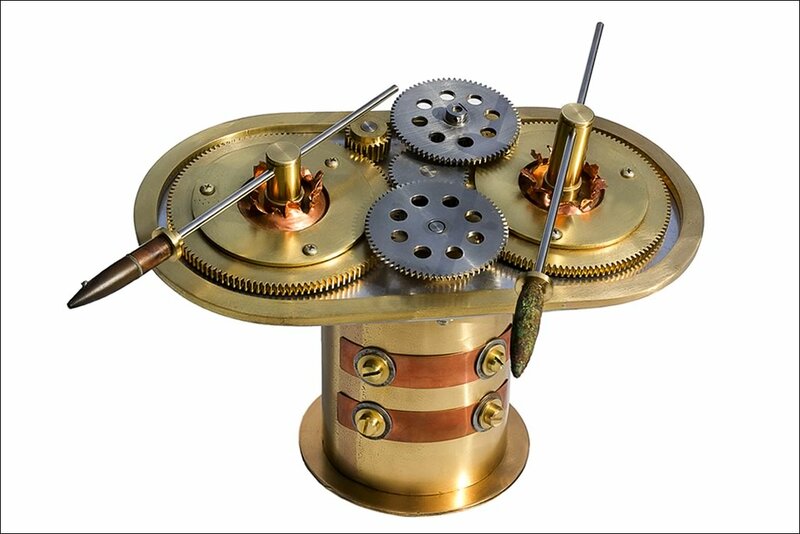 A stainless steel and brass sculpture, of the Steampunk genre, engineered with sophisticated mechanical components, which encases a movable Gear Art assembly consisting of rows antique brass gears staked into glass sheets. 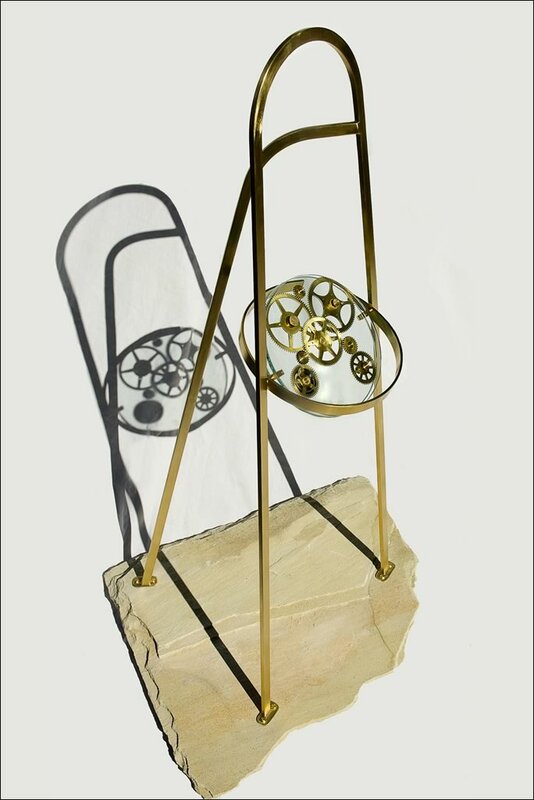 Using timeless elements: stone, metal and glass, Davide puts time itself on kinetic display freestanding sculpture. 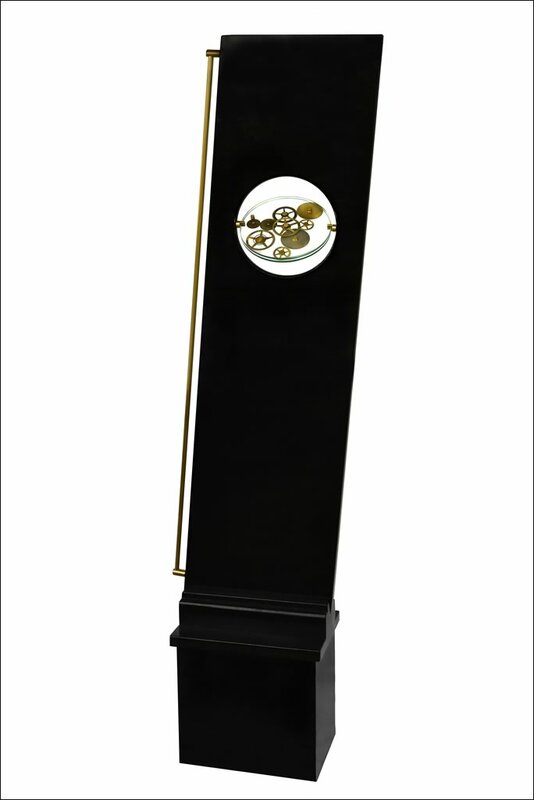 Standing 74” high, by virtue of sheer size, Time Elemental commands attention. 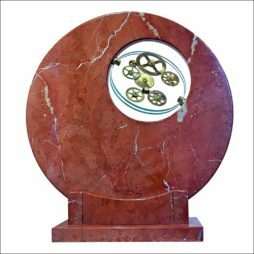 Glass discs rotate freely within their granite confine, while antique clock gears turn at the slight touch of a finger in this moving gear art sculpture. 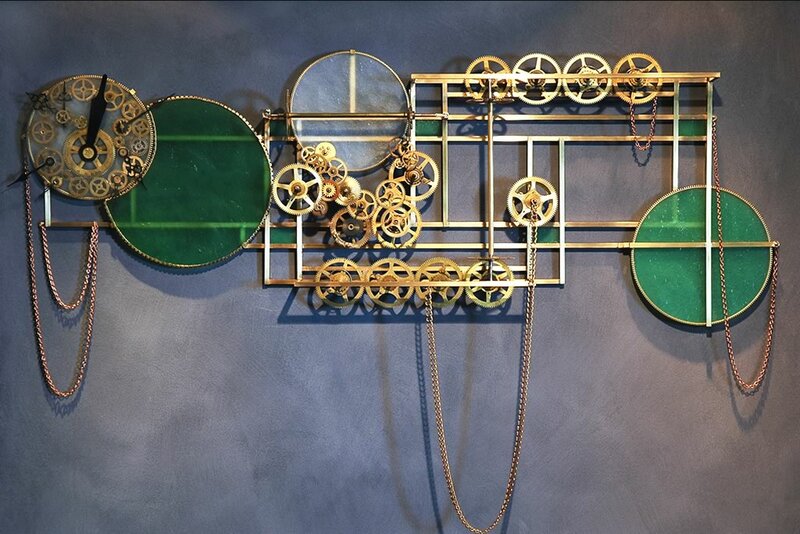 A wall hanging sculpture incorporating Industrial Age artifacts. Time generally passes slowly, evenly, but at moments is disturbed, engaged, irregular in its beat. StormWatch reflects its disorder: recumbent the pendulum awaits order, realignment, before it can return to its accustomed measured rhythm. This working clock, while keeping present time, confuses us by constantly alluding to it’s Industrial Age past. Davide’s ongoing fascination with time takes a turn from her inquiries of the past as she begins a new focus on present day living and social interaction and relationships. In this fully kinetic gear art sculpture, Davide contrasts the cold, yet contemporary feel of steel with rich, warm colors as she considers contrasts of public versus private sensitivities. A kinetic, metal sculpture and Memorial to legendary WWII fighter-pilot, Major Thomas B McGuire Jr. (namesake for McGuire Air Force Base). This motorized metal sculpture is the offspring from a painstaking undertaking by artist Andrea Davide, and a specially assembled committee of military experts, to uncover the mystery of the downing of the aircraft of Major Thomas McGuire, the renowned American WWII fighter pilot and his adversary, Imperial Japanese fighter pilot, Akira Sugimoto over the Philippine Islands. In a twist of remarkable fate, the exact artifacts that were once used against each other, resulting in the deaths of both pilots, exist here entranced in time, circling around one another. A historical metal sculpture comprised of military artifacts in tribute to legendary WWII fighter pilot, Major Thomas McGuire Jr. Companion to Eternity of Fate, Timeline of Destiny displays elements of ritual order, of remembrance of time past, as both an aid to memory and as a memorial to the life of Maj. Thomas McGuire. His death is still an unfinished story; parts of Timeline of Destiny recovered from his crash site challenge us to complete it. A highly engineered, motorized metal sculpture which moves on 3 planes. Commissioned by SDP-SI, a large manufacturer of gears, drives and motors, this Engine of Time elevates form and function to art through its design. Gears in precise linkage rotate, plane upon plane, as chains drive their containment discs and, illumined by a central tower of light, the Engine is patient, busy, performing its unknown tasks as it moves smoothly through space and time. 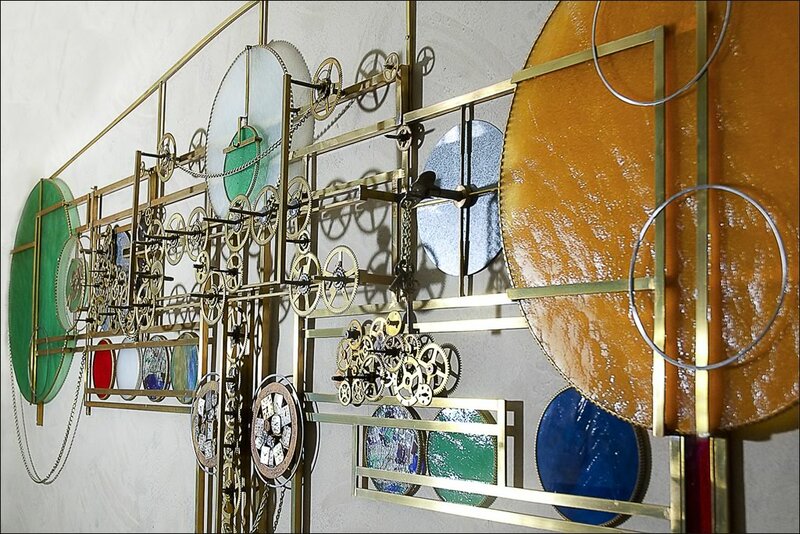 Wall hanging sculpture made of metal and glass and gears. A tightly engineered, wall hanging sculpture, which marks Davide’s transition into metal sculpture. 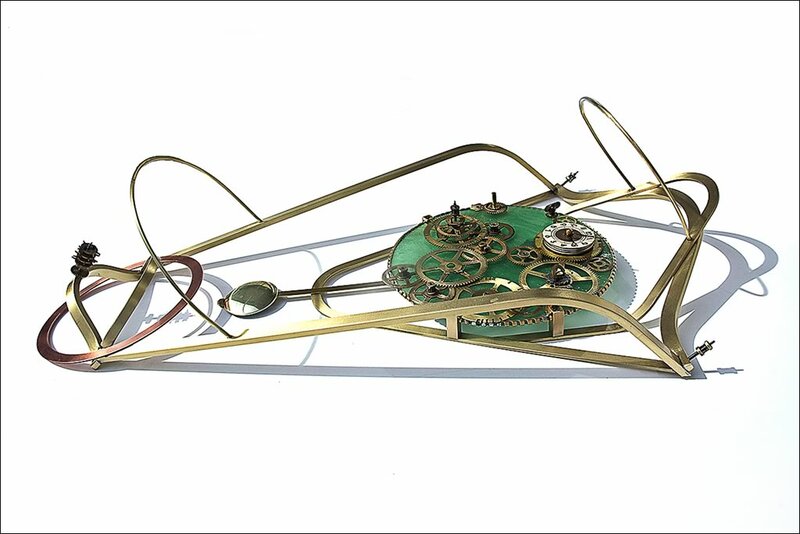 One of Davide’s few wall hanging sculptures, TimePiece is a combination of repurposed antique clock parts, stained glass, and brass bars, which are used to create a geometric framework with the intent of invoking a sort of conceptual timeline. 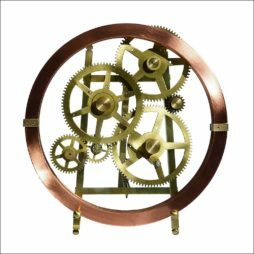 This Gear Art sculpture feels like it belongs back in the Industrial Age due to its materials, though it fits more realistically into a home decor placing of contemporary art. 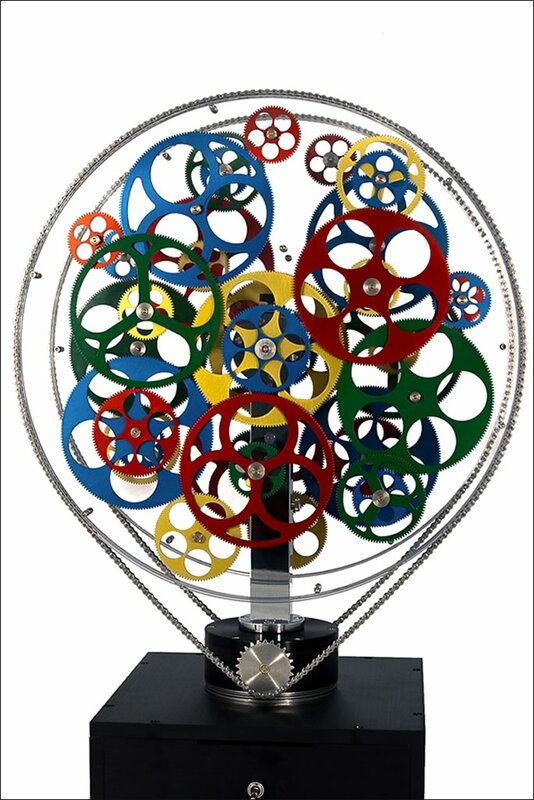 A freestanding, kinetic sculpture which draws upon Davide’s formal association with the United States Air Force. Davide departs from her initial work as painter of historical aviation for the Pentagon, crossing over into 3 dimensional works. Winged Escape is a conceptual sculpture, which takes the shape of a WWII era fighter-plane wing. 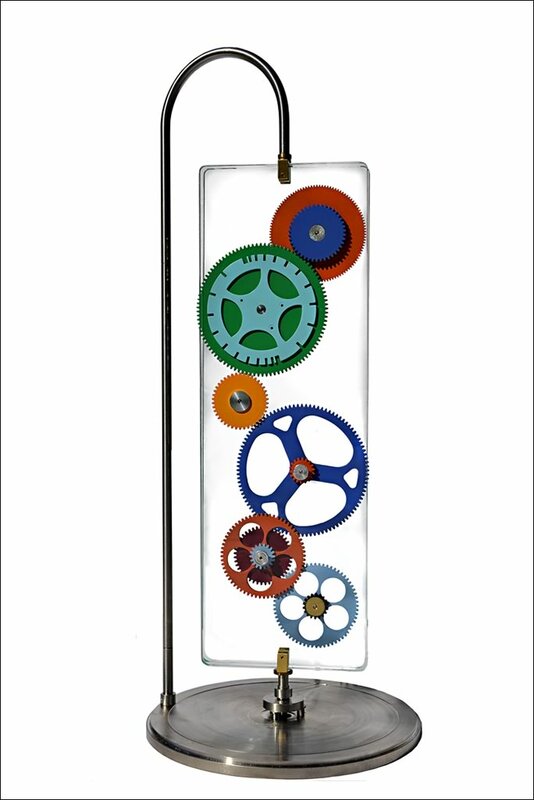 Onyx, glass and painted gears examine the direction of the flow of time. Substituting bright colors for her usual antique objects, in this contemporary, gear art sculpture, Davide looks to the future with hope and optimism. The translucency of the white onyx, which houses the kinetic (movable) RoundTimer, constantly transforms in accordance with the dayʼs changing light. Sunlight streaming from behind intensifies the translucency of the stone, while at night, when lit from the front, the colors are gentler and subdued. 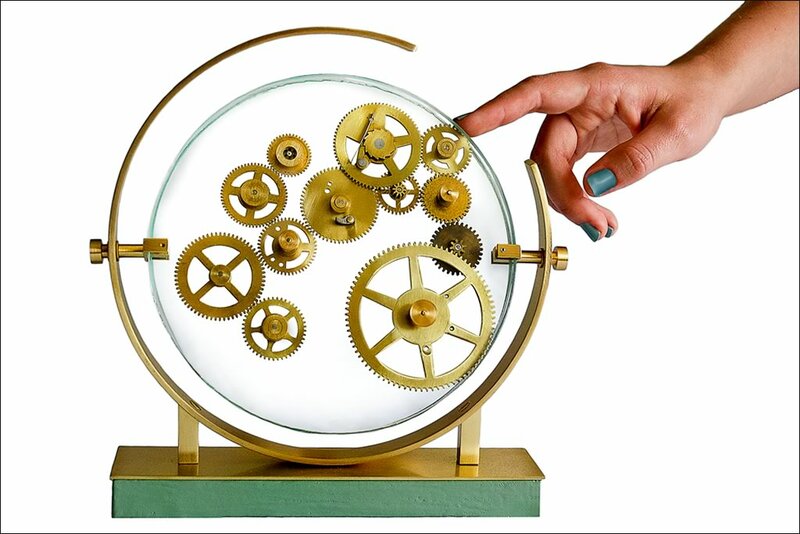 Gears turn with the touch of a finger and the glass also can be rotated by hand. 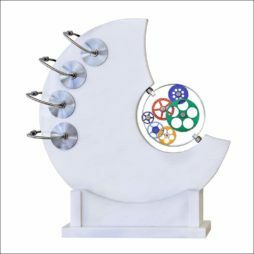 This highly engineered, kinetic Gear Art sculpture beckons the viewer to pick it up, feel it’s perfectly balanced weight, and manipulate it’s multidirectional movements. 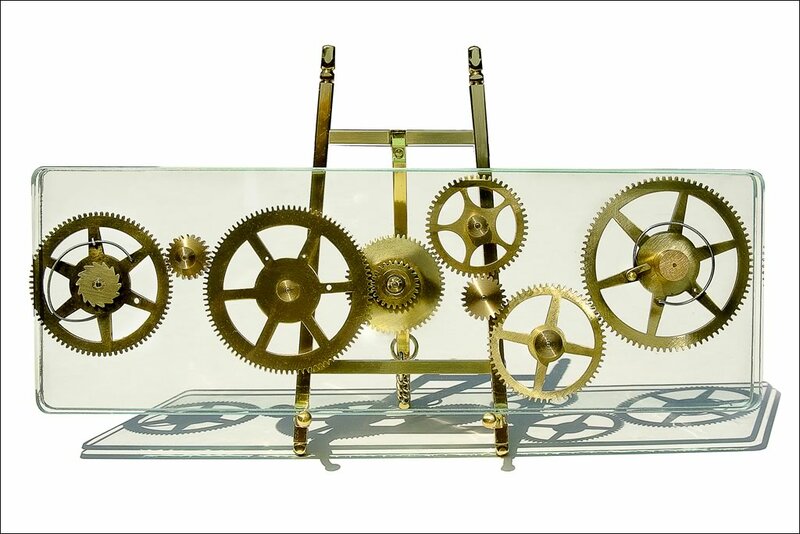 A kinetic sculpture made of brass, antique gears and glass, seated on it’s own handmade brass stand, inviting interaction. RoundTimer On Stand is at once part of an industrial age long gone, but belongs in the house of the future.